This is based on a salad that our local Whole Foods sells in their deli. It's a very delicious crunchy salad bursting with loads of flavor. Be sure to use the chile powder spice, not just dried red chile. We used a handful of nuts from a jar of Costco's mixed nuts. I added sesame seeds, dried cranberries or dried cherries and fresh blueberries. It is hard to get more healthy than that. This is a great recipe for the road because you can use up fruit you already have and don't most of us travel in our RV with some assorted nuts to snack on? 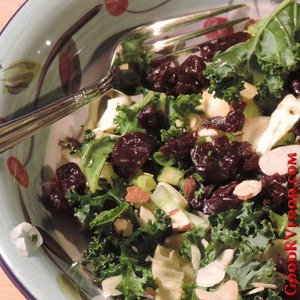 Even if you think you don't like Kale give this one a try, you might be pleasantly surprised. Whisk the olive oil, lemon juice and chile powder together in a large enough bowl to hold all of the salad. Wash the kale well and remove the ribs. Chop fine and add to bowl with dressing. Mix well. Add chopped nuts, sesame seeds, sunflower seeds, dried fruit and fresh fruit. Serve and enjoy.